Igor is friendly and helpful. Good communication and quick response to our request. The property is located very near to major attractions which are all within walking distance. The apartment has everything we needed including washing machine and laundry rack. It is very spacious and comfortable. We enjoyed our stay in the apartment. Highly recommend. There were very many sports clubs at the property. Many kids meant that it was often loud outside during the day. It also seems as if everything revolves around tennis. I didn’t like that I had to pay extra to use the gym and indoor pool. The hotel’s facilities as such were good. The bus connection to the airport was poor. Where to find Pula hotels near an airport? Where can I find hotels in Pula that are near tourist attractions? Should you be seeking comfortable accommodation in Pula, you've got plenty to choose from. There are 32 short- and long-stay options within a 0.1-kilometre (0.06-mile) radius of downtown Pula in Expedia's comprehensive accommodation pages. One of the secrets of stress-free traveling is location, so check out the latest deals at the Hotel Scaletta and Hotel Galija, all of which are located within a 1-kilometre (0.6-mile) radius of downtown Pula. If you plan to stay close to the Pula Arena, the Temple of Augustus or the Pula Fortress there are a number of alternatives. Hotels that are close to the Pula Arena include the Guest House Hotel Riviera and the Splendid Golden Rocks Resort. 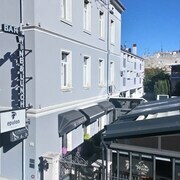 The Guest House Hotel Riviera is 0.3 kilometres (0.2 miles) from Pula Arena, while the Splendid Golden Rocks Resort is situated 0.3 kilometres (0.2 miles) away. The Villa Gorana- Apartments and the Horizont Resort are conveniently located easy walking distance from the Temple of Augustus. And finally, the Boutique Hotel Villa Vulin and the Pula City Center Accommodation are nearby to the Pula Fortress. It's only 2 kilometres (1 mile) to the Boutique Hotel Villa Vulin and 0.8 kilometres (0.5 miles) to the Pula City Center Accommodation. 30 kilometres (17 miles) from the main part of Pula, is the Maistra Monte Mulini. The Aparthotel Villa Valdibora is situated 30 kilometres (18 miles) away. Two other Expedia-listed hotel and apartment options around this area include the Maistra Istra Hotel Rovinj and the Villa Stefanija. 65 kilometres (41 miles) to the northwest of Pula is Umag, where you can spend the day visiting Savudrian Lighthouse and Church of St. Mary. The Meliá Istrian Villas and Sol Aurora - All Inclusive are a few of the great accommodation alternatives in Umag. 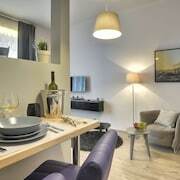 Or, you could consider staying in Porec, 40 kilometres (26 miles) to the north of Pula, where you can pick from the Villa Gloria and Hotel Filipini. The Baredine Cave and Basilica of Euphrasius are a couple of the popular places to experience when visiting Porec. Why don't you check out Expedia's Pula travel guide and learn about the terrific things that this area offers visitors. 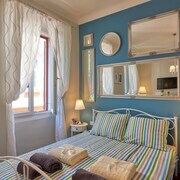 What are the most popular Pula hotels? Apartment is in Center of Pula, Just Next to Amphitheater- Close to all Events!! Are there hotels in other cities near Pula? What other types of accommodations are available in Pula? Explore Pula with Expedia.ca’s Travel Guides to find the best flights, cars, holiday packages and more!